In case you didn’t notice, the US Centers for Disease Control published their long-awaited (dreaded?) “CDC Guideline for Prescribing Opioids for Chronic Pain.” It made a pretty big splash: Five editorials plus the full Guideline in the online Mar 15 JAMA, front page New York Times feature article, the first hour on NPR’s “Diane Rehm Show,” (Mar 17) and multiple others. It is specifically aimed at primary care prescribers, who write about half of the scripts for opioids in the US. It is intended to “support clinicians caring for patients outside the context of active cancer care or palliative or end-of-life care.” The Guideline was published in the Mar 15 Weekly Morbidity and Mortality Report and is the first US Government guideline to address treatment of chronic pain; it is 52 pages long. A good “Cliff Notes” version of the Guideline is the JAMA piece by CDC Director Thomas Frieden, MD and Debra Houry, MD. I should point out that the document was prepared by the CDC’s Division of Unintentional Injury Prevention. The Guideline is intended to address the epidemic of opioid-related deaths, not the pandemic of chronic pain. On its face, the Guideline promotes good, standard prescribing practices, especially for potentially high-risk agents: history and diagnosis of the painful disorder, prognosis of the painful state, history of prior interventions, establishing clear treatment goals, careful selection and implementation of treatments based on patient informed consent and risk-benefit discussion, and close follow-up with scheduled re-evaluation of the condition and effects of the intervention. 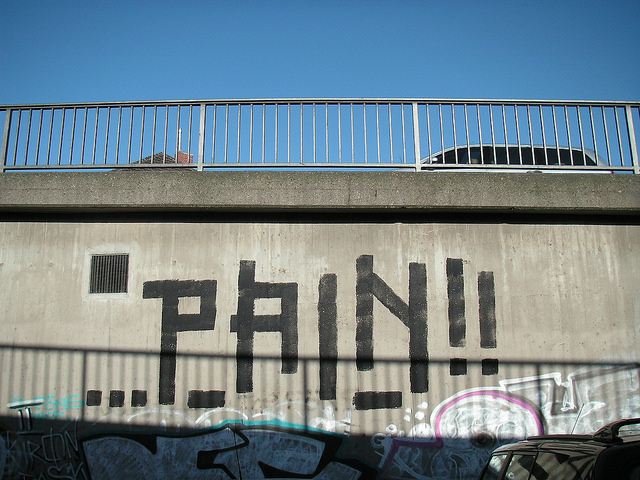 Appropriately, the Guideline states that “nonpharmacologic therapy and nonopioid pharmacologic therapy are preferred for chronic pain.” The Guideline focuses on chronic pain, but points out that many prescriptions begin for acute pain. For acute pain, the lowest effective doses of opioids for the shortest possible course (3 days or less; “more than 7 days will rarely be needed”) should be used. Additional risk-management strategies for opioids include: using short-acting opioids at the commencement of treatment; avoid concurrent benzodiazepine prescribing; evaluate patient history of substance misuse; use the state prescription drug monitoring program (PDMP); do initial and periodic urine drug screening. “Higher” opioid doses are defined as those greater than or equal to 50 morphine milligram equivalents (MME) per day, and the prescriber should “carefully justify” any increases to ¬> 90 MME/day. The discussion states that the 50 and 90 MME levels were chosen because of epidemiologic data showing increasing risk of overdose as the prescribed dose increases. So, what are the implications of all of this? a. The Guideline highlights a major public health issue, namely a dramatic increase in the past 20 years in opioid prescribing and a corresponding increase in opioid overdoses and deaths, especially in the past 10 years. b. About half of all opioid prescriptions are written by nonspecialists, many of whom have asked for a guideline for treating chronic pain with opioids; this Guideline responds to that need. 4. Many insurance plans will not cover so-called alternative interventions such as therapeutic massage. [I acknowledge a major burden on insurance plans to start covering everything in the “alternative” realm. How could they possibly evaluate them all? Perhaps plans could consider an ‘allowance’ for alternative interventions: massage, acupuncture, yoga, tai chi, etc. The PCP and patient could choose which approach seems most appropriate to the individual situation]. 5. Not only is it quick and easy to write a prescription (with some serious attendant risks), but analgesics generally work much faster than other interventions. Sometimes analgesics make it possible for patients to participate in other interventions, such as physical therapy. I fear that some clinicians will interpret the Guideline as requiring physical therapy prior to using “strong analgesics” such as opioids. 6. Alternative analgesics may not be as effective and may has their own serious side effects and contraindications. 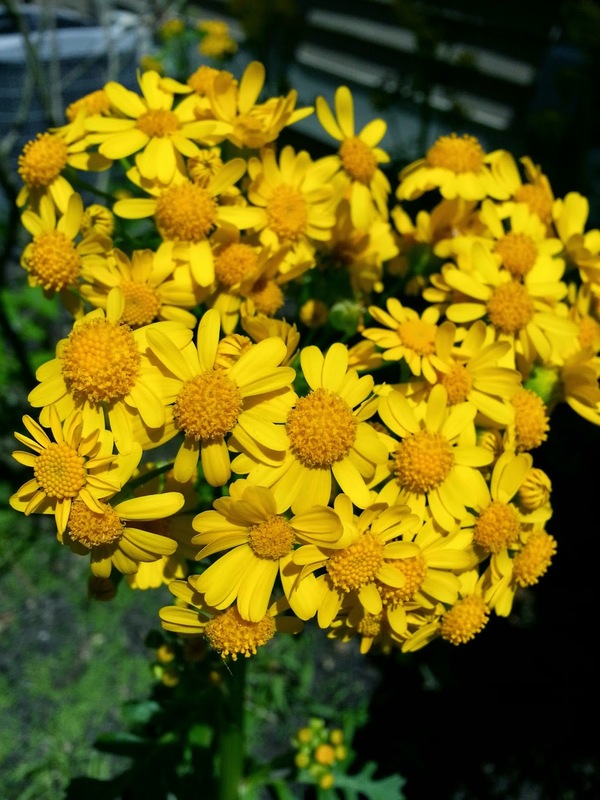 NSAIDs are an obvious example of those with serious side effects, especially in elders. Acetaminophen has recently been shown to be no more effective than placebo for osteoarthritis patients in a clinical trial. 7. Because of DEA practices it is already difficult for pharmacies to maintain sufficient stock of opioids, so patients commonly must do monthly “pharmacy shopping” to fill their prescriptions. 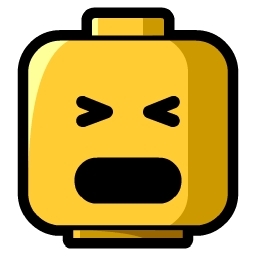 Do prescribers “get” this when the PDMP shows their patient getting their meds at a different pharmacy 4 months in a row? 11. The Guideline has the potential to reinforce prejudice against opioids and opioid-users that is already extensive in medicine, nursing, and pharmacy. 12. Despite language that encourages individualizing treatment plans, the barriers to complex plans are not addressed. Nor is individual patient response. “Start low, go slow” is almost always appropriate, but therapeutic limits to dosing based on epidemiologic data is not entirely rational. The patient in front of me is always an anecdote. But every anecdote falls someplace on a normal curve. We don’t know, especially when initiating treatment, where the patient will ultimately fall on the curve. 13. The Guideline discussion acknowledges that data on the effectiveness of opioids for long-term use is sparse, but lends a lot of weight to research that could be interpreted to suggest that opioids “don’t work” for chronic pain. But the research base is very, very thin. 14. There are many research questions to be addressed, some of which we really haven’t figured out how to ask, much less design an adequate study around. And who will pay for and who will do long-term studies? a. What are the biological differences between those who become “addicted” vs those who don’t? Is there a continuum? If so, might an individual move in both directions on the continuum? b. What is the impact of rate of metabolism for certain opioids on safety and effectiveness of pharmacologic treatments? What is the prevalence of the so-called ultrarapid metabolizers vs poor metabolizers? c. What does “opioids for chronic pain don’t work” really mean? [This clause does not come from the Guideline but is similar to statements made by groups who advocated for the Guideline as a way to reduce opioid prescribing]. d. There seems to be a subset of people who are very functional on long-term opioids—what differentiates them from the “opioids don’t work” population? e. There has been some interesting work showing persistent changes in the brain after opioids have been discontinued. What is the extent of these changes over large populations? Are there predictors for which changes and what their behavioral effects are? f. So, really, what is the risk of becoming “addicted?” The varying finding of 0 to 50% just isn’t helpful, and neither the upper nor lower percent seem very credible. How is a clinician to determine, and explain to a patient, what is the risk of addiction? g. Can we develop better tools for stratifying risk for misuse? h. Does “high risk” have to translate to “don’t treat?” We need evidence-based models for treating chronic pain in those with a history of and those with current substance use disorder. 16. The Guideline specifically does not include care of patients undergoing active cancer treatment and for those in palliative care settings. It remains to be seen what unintended impact the Guideline will have when pain may be part of a serious advanced illness, or may be part of one of several comorbidities. 18. Will professional organizations increase pain and chronic pain-related offerings at their annual meetings? 19. Will medical, nursing, dental and pharmacy schools start teaching more about “pain management” rather than just pharmacology and pathophysiology? 20. A major question has to be: can the efficacy and effectiveness of this Guideline be determined on a scale and in a time frame that benefits the most patients and society at large sooner rather than later? Does the government have a commitment beyond issuing a Guideline? Perhaps the CDC and collaborating NIH institutes can work with a couple of major health systems and major insurance companies to implement the Guideline in a study of a comprehensive approach to chronic pain management. The study would have to last a minimum of 2 years. It may make the most sense to start with new patients, not try to cram existing patients into the Guideline (that would be a separate study). This Guideline puts the prestige of the CDC and US Government behind an approach to prescribing opioids that is intended to help derail the epidemic of opioid-related deaths. CDC-monitored overdose deaths from all classes of drugs (in aggregate and by class) looked like they were leveling off in 2012 and 2013, but spiked again in 2014 (the most recent national data available). The Guideline is an appropriate step, but certainly inadequate to address the enormity, much less the complexity of the issue. 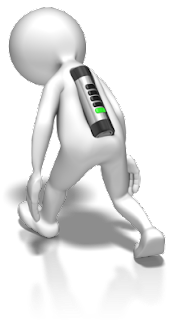 In addition, the inadequacies of practice and the knowledge base for treatment of chronic pain remain unaddressed. Thomas E Quinn, APRN-CNS, AOCN is an oncology and palliative care advanced practice nurse. He has recently accepted a clinical position at Jewish Social Services Hospice in Montgomery County, MD, which will really cut into his pickleball playing at the senior center. Do You Feel The Churn? by Dr. Linda Liotti, D.O. Do you feel the Churn? 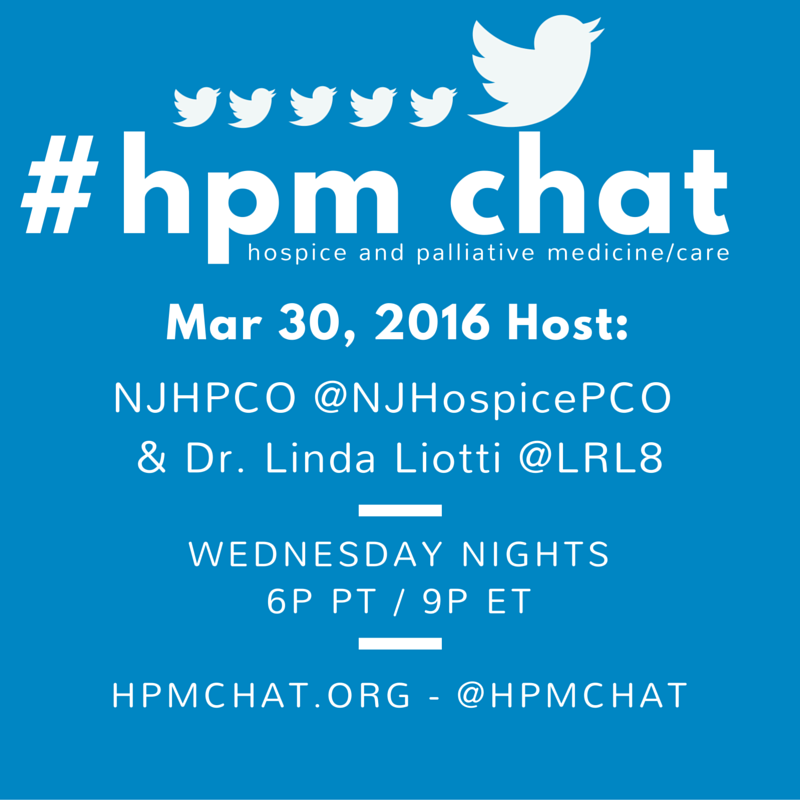 Over the last thirty years, there have been changes in the hospice and palliative care industry. Years ago, nurses carried a case load of 12 – 15 patients. Each patient was seen on a regular basis, their needs and concerns taken care of by the nurse and multidisciplinary team on a weekly basis. Most patients would be followed until death, however a few graduated from hospice when the IDT found they had stabilized. Recently speaking with several colleagues, we noted a trend which suggests the turnaround time from admission to death continues to shrink. When we attend the interdisciplinary team meeting to discuss admissions, there are times where greater than 50% of patients admitted in the past two weeks, have already died. This trend suggests a phenomenon where admission to pronouncement has escalated with several consequences. First, is that nurses are spending 3+ hours to admit a patient and complete the electronic medical record (EMR) documentation. Before the social worker or chaplain have time to build a relationship, the nurse is already doing the pronouncement. This very rapid cycle leads to compassion fatigue and burnout for nurses, doctors and the rest of the team as the workload has become much heavier. Median Length of Stay (LOS) for New Jersey is 18 days, down from 19 days in 2013. Average LOS for NJ is 61 days, down from 63 days in 2013. Nationwide statistics are only slightly higher than New Jersey. Median LOS and Average LOS for 2015-2016 are expected to be even lower. One reason for short length of stay and last minute admissions seems to be late referrals. Suggested reasons include the impact that palliative care programs, Accountable Care Organizations (ACO’s), visiting physician services, and growing hospital systems have on the timing of the hospice referral. 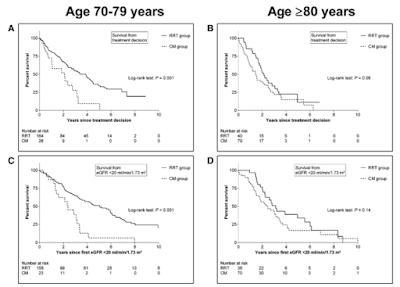 Is the timing between admission and death shrinking? Do social workers and chaplains have enough time to get involved? Does this add to compassion fatigue and burnout for clinicians? What is the future of hospice and palliative medicine as mergers, acquisitions and consolidations continue? Read more about burnout, compassion fatigue and self-care on Pallimed. 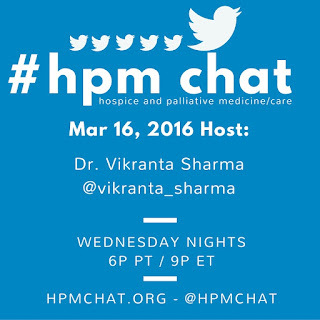 Follow @hpmchat and go to www.hpmchat.org for up to date info. For more on past tweetchats, see our archive here. A little over a year ago I wrote a Pallimed article called, "We Don't Know Death: 7 Assumptions We Make about the Dying." Having knowledge of our assumptions is a first step, but what do we do with that knowledge? Since I wrote that article, I have further contemplated the “so what” factor of the assumptions to develop suggested interventions. This article is the fourth in a series of articles where I will take each assumption from the original article and explore the concept in greater depth to include implications and possible interventions. In my last article, I wrote about the assumption Family will want to be with their loved one when they are dying. Here is our next assumption: People don’t want to be alone when they die. This may be an unpopular assertion within my own hospice industry for me to advocate for leaving a patient alone sometimes. Hospices have entire programs devoted to assuring patients and families that they will not ever be alone. Many of them are actually called, “No one dies alone” or NODA. The perhaps unintended consequences of the marketing of these programs is the programs may perpetuate the myth for the public that nobody ever wants to die alone. For the family member who has minimal prior direct experience of being with a loved one as they die, this assumption that dying patients shouldn’t ever have to be alone can create intense anxiety. Family members will sit vigil for days without eating or sleeping. Hospice professionals may inform the family they can take a break, but this can be a confusing mixed message. Hospice has a program that says that no one should have to die alone, and yet this hospice nurse is telling me to take a break? Some patients want to die when no one else is there. Hospice professionals know that companionship while dying is a personal preference. We have those patients who die in the middle of the night. We hear stories about the loved one who just stepped out for five minutes and the patient died. We may have even witnessed a quick death ourselves. I believe this happens by the patient's choice. When my mom was on hospice and they said her death was close, I sat vigil with my mom throughout the night, sleeping in an uncomfortable recliner. I finally went home to take a shower and mom died when I was 10 minutes away from returning to the facility. I was racked with guilt. Years later when I was working in hospice, I reconciled what had happened after I observed many deaths where patient died after family stepped out. It seems to happen most often when the patient is a parent. I believe it is a protective factor. A patient might die when their loved one steps out of the room for just a minute or right before they arrive. It is gut wrenching for the family member if they’re not prepared for this possibility. Suggested Intervention: Educate family prior to when patient is actively dying that the patient may purposefully die when family is not present. Before I started having these preparatory conversations, I noticed that the bereaved family members always had strong feelings of guilt for “not being there” when the patient died. They felt their physical absence was somehow a metaphorical representation that they were not emotionally there for the patient. They believe they failed the patient. This rarely is the case, but guilt is a difficult feeling to alleviate. Loved ones can harbor this self-imposed guilt for years after the death. This conversation would perhaps give the patient the opportunity to let the family member know they are uncomfortable with the family member being present when they die. This may be too direct of a conversation between family and patient, so you really have to read whether they would be open to the discussion. A patient may worry that the family member would feel hurt by their choice, so they might not be able to articulate their preference. 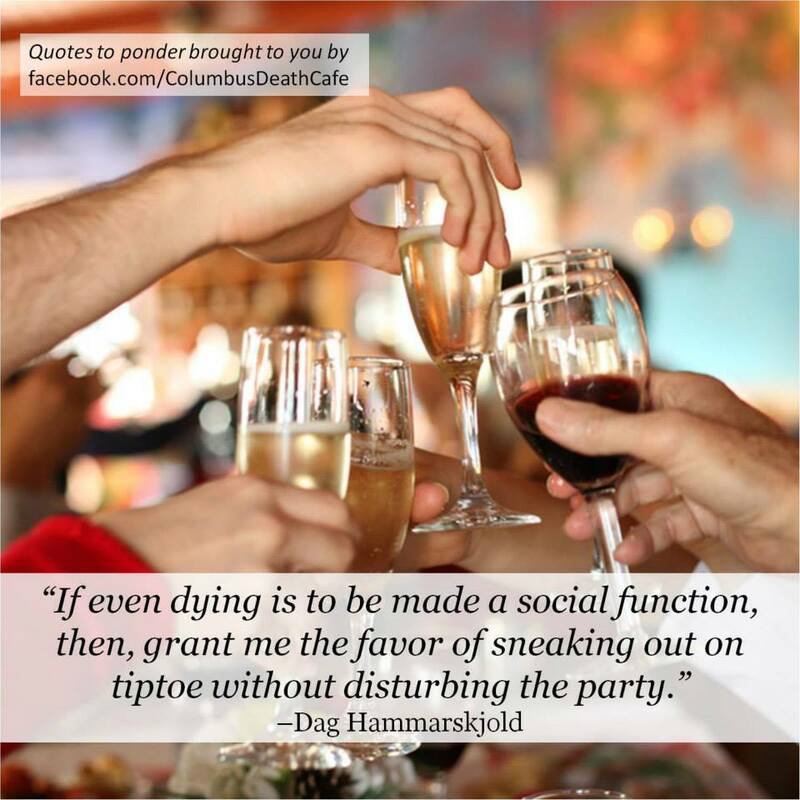 They also may not know what they would want, because imagining the moment of death might be too scary. Ultimately, the most important person to inform is any family member who seems to have the expectation that they will be there for the patient. Unfortunately, even if the family member knows the patient would rather they not be there, that does not mean they will honor the patient’s wishes. I saw a standoff between a private grandmother and an attached granddaughter that lasted way longer than it should have, because the grandmother said she didn’t need the granddaughter to be there, and the granddaughter insisted on vigil. We had an open conversation, but it didn’t help. The granddaughter won that one. Suggested Intervention: Remember, sometimes your intervention is simply listening. As hospice professionals, we can advise and facilitate, but ultimately, family dynamics are enduring throughout a lifetime. (This will be covered in a future article). When I was a volunteer, one time I was asked to sit vigil with a patient to relieve the family. But when I got there, the patient’s wife and daughter were so nervous about leaving that they stayed too. They asked why it was taking so long for their loved one to die. I explained the idea that sometimes a patient can’t or won’t die while family is present. They seemed to understand the conversation and eventually left. The following day, I went to visit again, but as it turned out, the patient had died when I was en route, and the hospice office did not have a chance to contact me. When I arrived, one of the patient’s daughters pulled me aside and told me that she listened to what I had said the day before and wanted to tell me what had happened with his death. She said when the nurse told her it was going to be soon, she called her mom and sister. 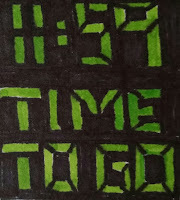 She leaned forward and said to her non-responsive father, “Dad, they’re coming. You and I both know that I’m the only one who can handle this, so if you’re going to go, you better go now.” He died within 5 minutes, before his wife and daughter arrived. I believe that everything happens for a reason, and I was not informed of his death so that I could arrive to the facility for the daughter to tell me her story. There was another patient with whom I had an open discussion upon our initial meeting. She was a mother and she told me she did not want her children to see her suffer. It was an offhand comment that was illustrated by her death five days later. Her daughter was present at the home and the nurse told the daughter that the patient would be dying soon. The daughter stepped out of the room to call her siblings and in that moment, the patient took her last breath. The adult children all arrived within minutes only to find they hadn’t made it in time. As we waited for the funeral home, the family talked about the patient’s strong independent nature. I informed them that her mother had told me that she did not want them to see her “suffer” and that I believe she chose to go before they arrived. There was a moment of levity for them as they laughed and agreed that it would be just like her to do what she did. They were still mourning her absence, of course, but they admitted that they were comforted by believing their mom was protecting them by dying before they arrived. These are just a few examples of the times in which I have observed patients choosing to die in a loved one’s absence. As with the other assumptions articles, the purpose of this article is to bring to light some hidden assumptions that we or our family members may have, and identify how we may best support them in their journey. March is Social Work Month – a great excuse to take a moment and celebrate the work that clinical social workers do in palliative care. But, hang on, perhaps we should be doing more than that. Can we adjust our lens settings and challenge ourselves to see clinical social work differently? Palliative Care is a team sport; the standard model of practice includes an MD, NP and CSW. My challenge to all of you would be to make sure you are all equal partners in our unequal medical world. CSW’s can’t bill for in-patient visits, we can’t generate RVU’s for the hospital system, and it’s often hard to quantify data-driven results proving the impact of CSW interventions. I don’t know about you, but I work in a pretty physician-centric organization where there is a distinct pecking order. In fact, my hospital recently dissolved the CSW department in lieu of a Case Management Department. Medical social workers have been dealing with this for a long time (1920-30’s). Much of the work done by your CSW is unseen, done in private with a patient or family member – needing to have conversations away from other providers due to the nature of the content and emotions. The work you may see us doing might look like “general support” but I can tell you it is quite deliberate and well thought out, founded in evidence based theories. We choose our words very carefully. In fact, CSW has been having the “conversation” with patients and families for decades about goals of care, end of life and other difficult subjects. You may not know that the theory that grounds most of the communication skill and psychosocial protocols you use every day relies on the most fundamental social work tenant: start where the patient is. CSW developed the person-in-environment theory way back in the 1920’s and has served our profession well- understanding our clients in the context of their situation – which is now fundamental to all palliative care providers. What’s the big deal, you ask? It is important to recognize the significant contribution of Clinical Social Work to Palliative Care. Communication is the heart of palliative care, without that we are nothing. 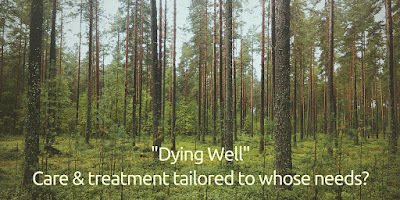 Before there was SPIKES, NURSE, VitalTalk, OncoTalk there was Clinical Social Work – communicating with patients and families and other providers about these difficult subjects. CSW also brings the concept of countertransference to the communication table. We don’t call it that when we are helping providers look at how their reactions impact the patient directly, (we call it self-awareness) but those are the theories we are using. So, thank your team clinical social worker today; treat them as your equal in this work we do with patients and families. We might not be able to bill, or add to the financial bottom line of the hospital, but we are the backbone of the communication and psychosocial skills you use everyday. Hospice and palliative medicine has been on my mind a lot recently. Of course, this is partly because it is a region in NephMadness but also because so much of the day to day work of a nephrologist deals with the end of life. Have you ever read a journal article and as soon as you finished the abstract you had this forbidding feeling that if the authors actually proved what they claimed to have discovered your medical life will never be the same? This happened to me when I read, “Functional Status of Elderly Adults before and after Initiation of Dialysis (OPEN ACCESS)” by Tamura et al. in 2009. 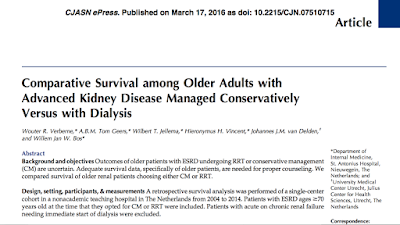 In this study the entire cohort showed a survival advantage with dialysis care but on further subgroup analysis, patients over the age of 80 did not gain additional time on earth by choosing dialysis. In this case dialysis did not extend life. 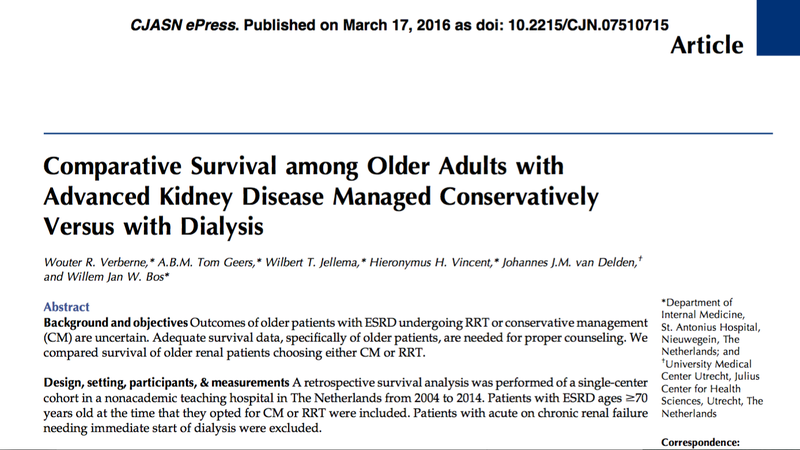 Nephrologists need to start to train ourselves away from the reflex that dialysis is a way to extend life. In some easily identifiable patient groups it provides as much harm as benefit. And this is just counting days alive. If you compare the quality of those days, perhaps by looking at Tamura's Functional status study, dialysis begins to look especially grim. This makes me happy that Palliative care is a region in NephMadness. 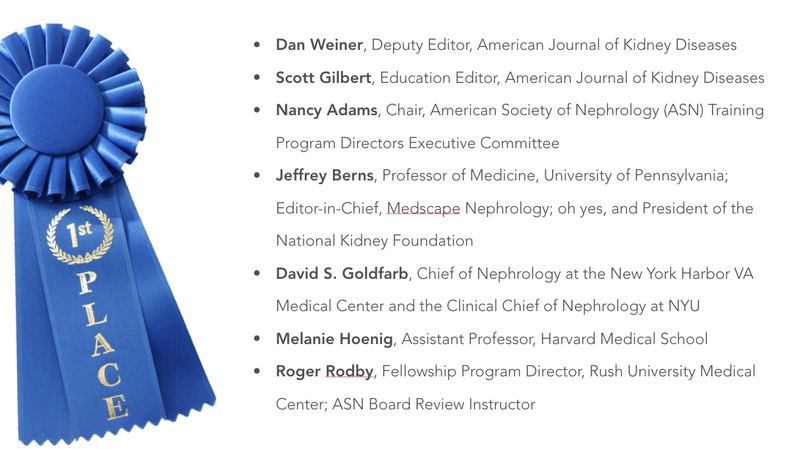 NephMadness is an online, social media-engaged, medical education project in its fourth year. It is an homage to the NCAA basketball tournament, March Madness. 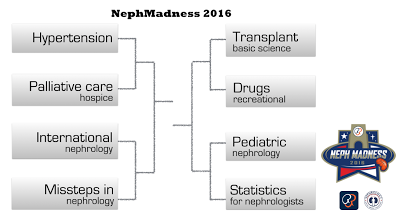 We replace the teams with a bracket full of 32 different nephrology concepts from 8 different academic regions. Then we replace the games (which normally decide the winners) with a blue ribbon panel that votes on each contest and selects the teams that advance through the brackets. Participants are invited to fill out their own brackets and see how well they match up against the Blue Ribbon Panel. There are prizes and bragging rights at stake. And no we aren't nerds. Why do you ask? Take a look at the brackets, fill out your own and then join us tonight to discuss the Palliative care region. Dr. Joel Topf is a nephorologist who writes at Precious Body Fluids and is a leading social media ambassador in nephrology circles. You can find him on Twitter @kidney_boy. Palliative Care in Nephrology - So Many Opportunities! If you asked most people to name what types of illness would most likely benefit from palliative care support, cancer is probably at the top of that list, followed by cardiac disease, and possibly neurologic disorders. Nephrology on the other hand is not often seen as a common area for the approaches of palliative care. 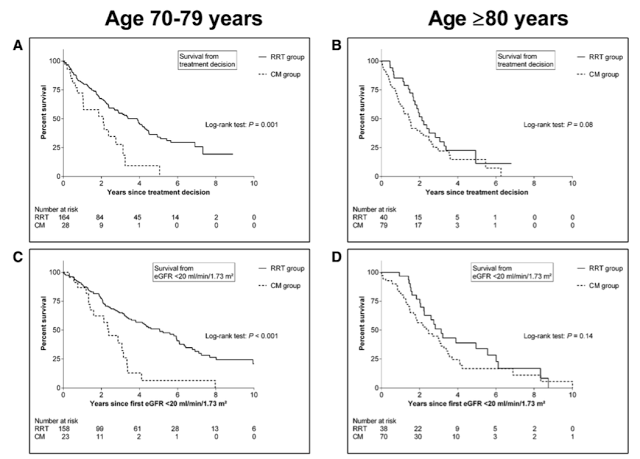 At most HPC conferences I go to, I may see only one topic exploring the unique palliative issues surrounding renal disease, despite the significant functional and symptom burden of advanced kidney disease. Thanks to social media I have found a group of nephrologists who are open to the concepts of palliative care both in practice and especially in education. In addition to hosting online book clubs on Atul Gawande's book Being Mortal, particpating in the most popular #hpm chat in 2015, they have now added palliative care topics to their very hip NephMadness tournament. 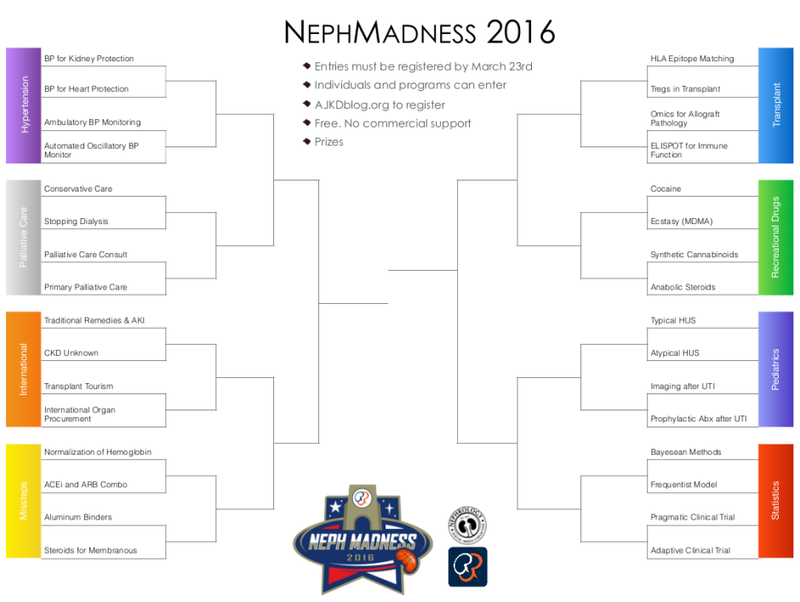 If you have not heard of NephMadness, then check out the NephMadness for Dummies post for more details. This group of nephrologists have been doing this since 2013 to use this game format nearly everyone in America is familiar with to highlight important topics in Nephrology. Each head-to-head match-up highlights why different educational concepts are more or less important to nephrology practice. So this year I was thrilled when the team asked me to contribute to a Palliative Care and Nephrology region. We had a phone call in early January after some emails back and forth to hammer out the concepts we would put into the tournament. We had 4 teams (slots) to put into the bracket and we came down to complimentary approaches: Conservative Care in ESRD vs Stopping Dialysis and Palliative Care Consultation vs Primary Palliative Care. I really hope you check out this novel approach to education, submit your picks (Go Palliative Care!) and maybe if there is enough interest they might teach us how to do Palliative Madness in 2017! PS Look a the cool cross word puzzle they made about palliative care in nephrology! PPS Check out what nephrologists are saying on twitter about Palliative Care #PallCareRegion! 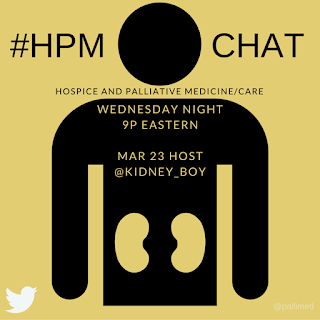 PPPS Join us Wednesday night as Dr. Joel Topf (aka @kidney_boy) hosts #hpm Tweetchat! Christian Sinclair, MD, FAAHPM is a palliative care doctor at the University of Kansas Medical Center and the editor of Pallimed. He was recently inaugurated as the President of the American Academy of Hospice and Palliative Medicine. When not reading medical journals, you can find him reading boardgame rules. What Does Giving Up Really Mean? 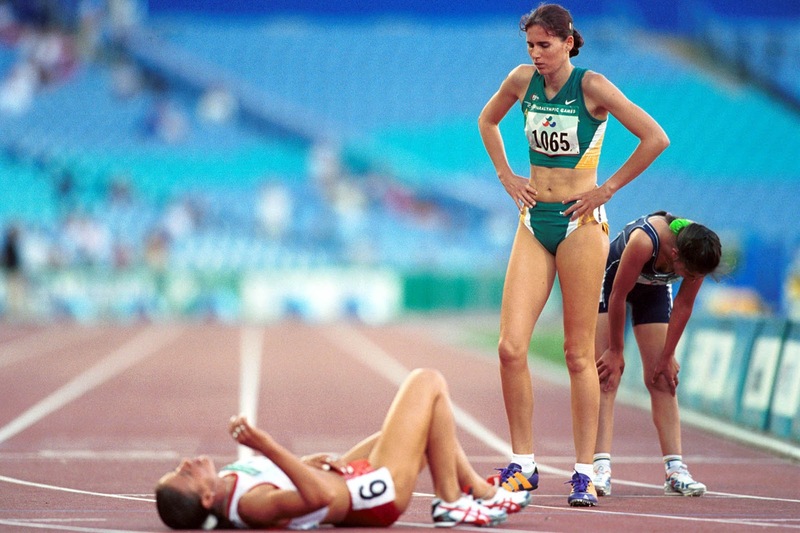 When you are running a race and your legs are burning, you stop on your own free will because the lactic acid is causing muscle cramping, burning, fatigue and pain. Then we can try again another day, maybe with the focus on “what is the real goal?” Is it to build more muscle to become an Olympian, to stay in shape, or just to improve on personal goals? Whatever it is, YOU have control over this to push on and not give up. The same goes for starting an education to improve your skills and find a better career. It will be hard and you will think about giving up but you will continue to push yourself because you have control over the situation. In my line of work with cancer patients, they have taught me strength, courage and most of all faith. Our goal as the palliative care team is to find out what the patient’s absolute end goal is, and is it attainable? A patient that has stage 4 lung cancer has been diagnosed with a cancer that is termed “incurable.” So does that mean if they die from this cancer they gave up or didn’t fight hard enough or didn’t have enough faith? I think only you can answer that question. But let me remind you that stopping a race because your lactic acid is burning the living heck out of your legs, and you can no longer keep up in school anymore, is something YOU have control over. When a cancer decides to take over despite the heart and soul your oncologist has put in your treatment plan, and all the faith you have given to eradicate this cancer, this is NOT a definition of giving up. 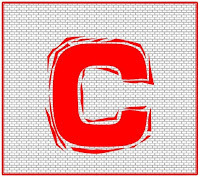 I have met patients that have “towed the line.” They ate right, exercised, never smoked and all around took excellent care of themselves and still got the dreadful “C” word. Then on the flip side, people that lead a very unhealthy lifestyle also get the “C” word. You see cancer is not biased, it doesn’t really care who it affects, or whose world it turns upside down and or bankrupts - cancer is not picky. When patients are given the diagnosis of “incurable” cancer, the goal should be to find a treatment that will extend their life as long as possible, and also balance the side effects with their quality of life. Cancer treatments have come so far in the last 15 years. Most importantly, the oncologist and researchers are always creating new novel treatments to search for a cure or to extend someone’s life as long as they can while living with an incurable cancer. The palliative care team works side by side with the oncologist to make this happen. We rely on direction from the oncologist and the patient to direct us in their goals. 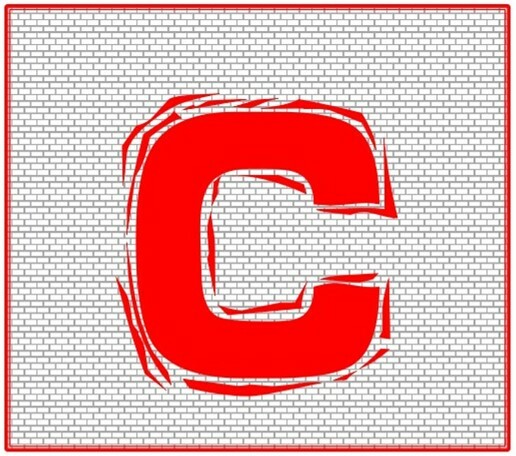 Of course everyone wants the “C” word to be cured, but if it cannot, what is your goal? Unfortunately, there might be a time when treatment is not an option anymore. You are so tired, the cancer is growing despite the treatment, and/or the treatment is taking all of your reserve energy away so that you cannot perform simple tasks. The risk is the treatment outweighs the benefits if the treatment is causing you more harm than good. If the side effects are just too dangerous or possibly even shortening your life, we look at you, the patient, to guide us on what YOU want for your goal. But NEVER should you utter the words, “Am I giving up?” Because remember that race you ran earlier and your legs were burning and you stopped? You had control over this situation. Unfortunately, cancer has its own plans and doesn’t play favorites, and sometimes it guides you to change your goal, not to give up. Now your goal can be to live as long as you can while feeling halfway decent. So stopping cancer treatment and doing best supportive care—just treating the symptoms of the cancer does not mean you are giving up. Even going on hospice when your cancer has made a decision you do not agree with also does not mean you gave up. It means you had no control over the cancer’s stupid decision, but you do have control over how you look at stopping treatment. This is different for everyone. So if this is you, please don’t say “but I don’t want to give up.” Please dig deep and find out what is really important to you and share this with your family, let them know, that you are not making the decision to stop treatment. The stupid cancer has made this decision for you. I will leave you with, taking off the burden of giving up and putting it on the shoulders of cancer NOT you! Amy Velasquez RN BSN Palliative Care Nurse Navigator for the University of Kansas Hospital Annette and Richard Bloch Cancer Center. Amy loves nursing and her hidden talents are triathlons and painting landscapes. This article is the third in a series of articles where I will take each assumption from the original article and explore the concept in greater depth to include implications and possible interventions. In my last article, I wrote about the assumption you’re supposed to be unconscious when you’re about to die. Here is our next assumption: Family will want to be with their loved one when they are dying. This assumption is widely held and we sometimes mistakenly put family members on the spot when we call them to inform that their loved one is transitioning, or “actively dying.” Of course, we do want to inform family when the time is near but we do not want to tell them in a way that implies our expectation that they be present. Additionally, just because a patient is a home patient, this does not mean that the family wants to be there. This whole article was inspired by an incident with a hospice patient and her children. The patient was being cared for at home and was admitted to hospice in her final days. On the day that she was actively dying, the hospice nurse went to the house to check on her. Because her symptoms were under control, and family members were present, the nurse was going to leave. The family, however, had other ideas. They wanted the nurse to stay there so they did not have to be there. Of course, the hospice nurse did stay with the patient and it all turned out okay, but hindsight is 20/20. It would have been nice to know ahead of time that the family had an aversion to being present in the house when their mother passed. From that point forward, I decided to learn family wishes upon admission. It is important to ask this question in a way that does not imply judgement of a “no” response. The reasons that people do not want to be present vary widely. Their reason may be because they feel disconnected from the patient. There may be a fear that it will be an unpleasant experience. Those of us in hospice know that the actual moment of death is most often quite peaceful and very meaningful. While we may be comfortable with death, it probably would be more harmful to try to convince a loved one of the beauty of the experience. In any attempt to convince them, we may be leading them to believe that we are not accepting of their choice and/or that we are judging them. Suggested intervention: Normalize patient “no” response to question about being present at TOD. There is no correlation to how much a patient is loved and whether family wants to be present at their death. There are often conflicting thoughts for family members who do not want to be present because they also do not want the patient to die alone. These family members often feel guilty for not wanting to be at the bedside. Suggested intervention: Implement vigil volunteers to sit with patients whose family members do not want to be present but have concerns about patient dying alone. Be aware, though, that it is possible that a caregiver will change their mind about wanting to be present. They may initially say they do not want to be present, but then choose to sit bedside after all. Suggested intervention: When a caregiver confirms they do not want to be present at TOD, let them know you will still inform them when the time is near. Again, this should be done in a way that does not imply any judgement about their choices. Also please note, if caregivers say they do want to be present at time of death, there are other assumptions we will want to avoid that I will be addressing in future articles of this series. As with the other assumptions articles, this was written with the hope that we acknowledge and explore the wide variety of viewpoints patients and families can have towards death. Note: To continue reading the assumption articles, the next one in the series is: Time of Death: Some Patients Prefer to Die Alone. Leela* was a 93-year-old female who had lived a long, happy and fulfilled life. She had been married to the love of her life for 55 years, had 3 children and many grand children. She had a long and satisfying career in health care and was very sure of her wishes about death and dying till she developed progressive Alzheimer’s dementia which became very advanced by age 93. She lived at home with her daughter Jennie, her caregiver and power of attorney for past 3 years. Unfortunately Jennie herself was recovering from a stroke she suffered last year. It left her with expressive aphasia and inability to drive. Her grand daughter Sue was the new caregiver for both of them for the past 12 months. Leela was declining, she had developed difficulty swallowing due to the progressive neuromuscular weakness that comes with advanced Alzheimer’s dementia, she needed full assistance in bathing, toileting dressing as well as feeding, her speech sparse and meaningless. Essentially, she was bed bound. She lay curled up in a fetal position most of the time. Recently she had started spitting out the pills that were put in her mouth and refused to be fed. She was admitted with a second bout of aspiration pneumonia and altered sensorium. She was treated with antibiotics and hydrated briefly, without any significant improvement in her functional ability. She could barely open her eyes to command and then quietly close them again. When asked about her wishes, Sue told me that her grandma was a registered nurse and never wanted to have tube feeds and wished to go naturally without tubes or heroic efforts when the time came. She had seen too many people suffer with unnecessary care. Jennie nodded in agreement and she and I signed the POLST form that makes these wishes an order. There was hushed mention of a distant son who had not seen her in the past few years, but Jennie said she would inform him as well. Leela started home hospice after obtaining consents from the daughter. Two weeks later, an angry son called hospice and asked his mother to be taken off the hospice, he called 911 and demanded her to be taken to ER, he wanted her hydrated, treated with antibiotics and possibly started on PEG tube feeds, as he felt that this amounted to starving her. He still wanted no CPR or intubation, but did not agree with hospice philosophy. The patient was taken off hospice and after several family meetings a PEG tube was placed and she was accepted in a nursing home. Medicare would now pay for her room and board due to the newly placed G tube. In America, surrogates often override the decision of an incapacitated relative, regarding end of life care. Various reasons involved include religious beliefs, personality conflicts, misunderstandings and financial reasons. POLST is meant to be a legal document to help convert a patients known wishes into physician orders. However, families make decision collectively and may influence the behavior of the surrogate. Sometimes that decision may go against the wishes of the patient. It is an outrage that our healthcare system pays for doing more to the patient than doing something for the patient that the patient actually wished for! Medicare will not cover the stay of a dying patient in a nursing home but will cover the stay if they have a procedure like PEG tube that automatically qualifies them for a hundred days in the nursing home. Leela passed away few months after PEG tube feeds were started, she developed diarrhea after being in the nursing home, where she died with decubitus ulcers and sepsis finally. At least she didn't die hungry. 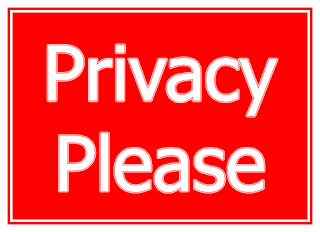 *Names and details have been changed to protect the privacy of patients and family. Vikranta Sharma is a hospice medical director at the Visiting Nurse Association Health Group in New Jersey. Join us this week on Wednesday, 9pm EST, 6pm PST for #hpm chat for a discussion on this topic and more!